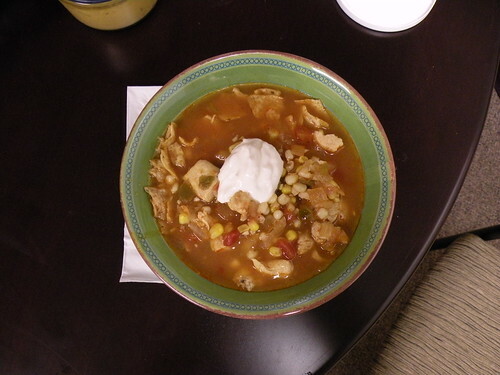 to celebrate the first day i wore a jacket to work this fall, i made a pot of chicken tortilla soup. this soup is quick, simple and delicious. i serve it over crushed tortilla chips and top it with sour cream and shredded cheese. then add the broth, corn, onion, chili powder, lemon juice and salsa. reduce heat to low and simmer for 20-30 min. break up some tortilla chips into individual bowls and pour soup over chips. top with cheese and sour cream. I could gobble that right up!! !